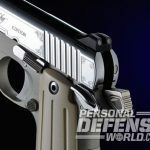 Small and precious indeed—meet the new ultra-compact Kimber Micro Diamond 1911. 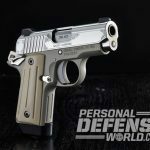 Kimber’s Micro Diamond has an attractive polished finish, scroll engraving and Ivory Micarta grips. Note the ambidextrous safety lever. 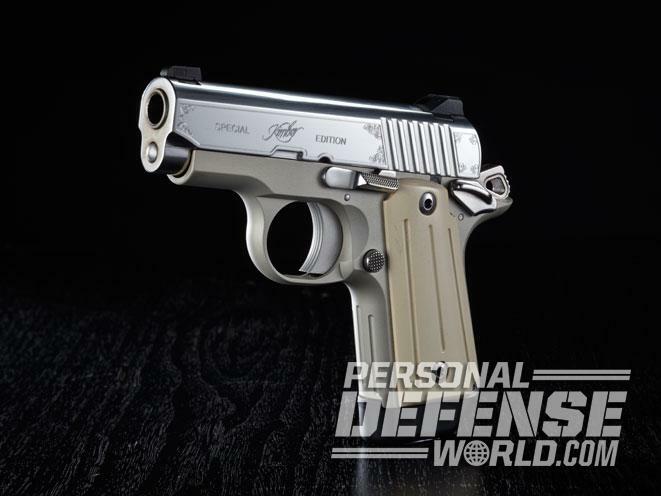 The pistol sports a Commander-style hammer and tritium night sights. A full-length recoil spring guide rod helps ensure reliable functioning. 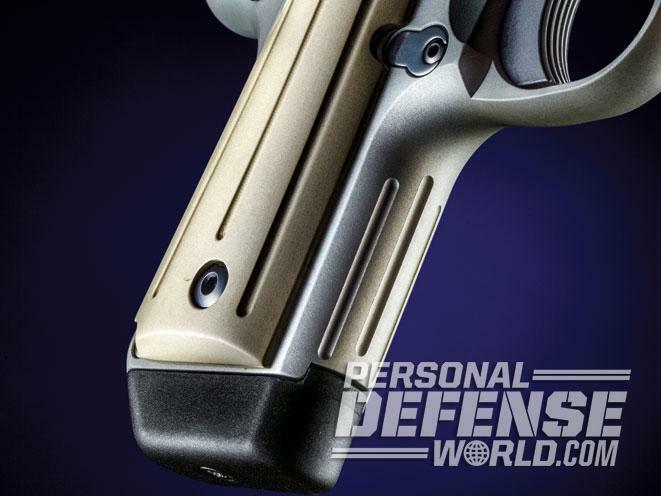 The extended mag holds an extra round and provides a full, three-finger grip. The mag release is located in the proper 1911 position. Also note the trigger face’s anti-slip serrations. 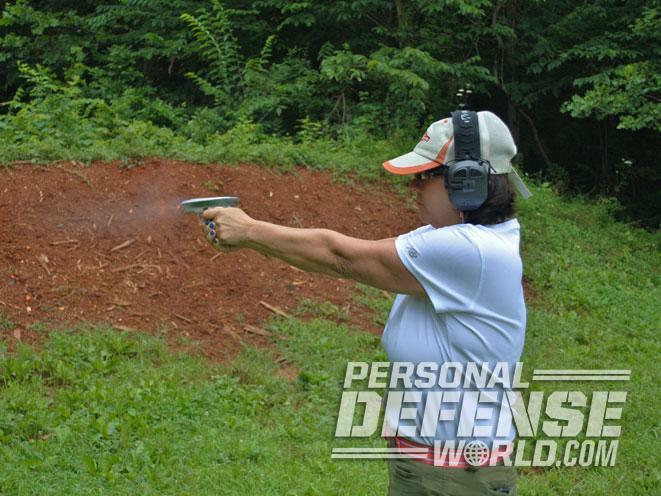 Anyone who has perused the gun mags at the local bookstore is aware that for the past several years the hottest items on the CCW market have been .380 pistols. The .380 ACP cartridge was introduced in Europe in 1912, where it is known as the 9mm Browning Short. In Europe, it never achieved the same levels of popularity as the 7.65mm Browning (a.k.a. .32 ACP), but on this side of the Atlantic the story was different. Those persons favoring the autoloader gravitated towards .380-caliber pistols rather than .32, and to satisfy this market in the pre-WWII years, Colt, Savage and Remington all produced .380s. 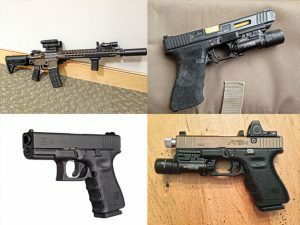 But just as semi-auto pistols have replaced the revolver with American law enforcement and civilian shooters, the .380 pistol underwent a resurgence of popularity in the first decade of this century. Today, it seems that just about every handgun maker of note has at least one .380 autoloader in its product line. 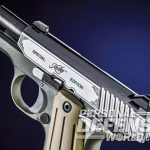 For years, Kimber has offered a series of high-end 1911 pistols that have found ready acceptance by police agencies, the military, competitive shooters and civilian gun owners. 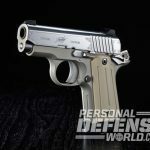 In 2013 the company introduced its line of Micro pistols, which now includes no less than 12 models that each sport distinctive features to set them apart from the other members of the family. 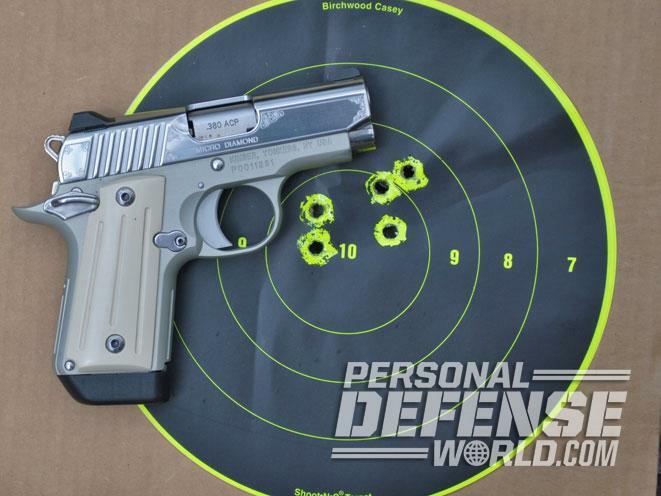 The subject of this report is the brightest member of the tribe, the Kimber Micro Diamond. 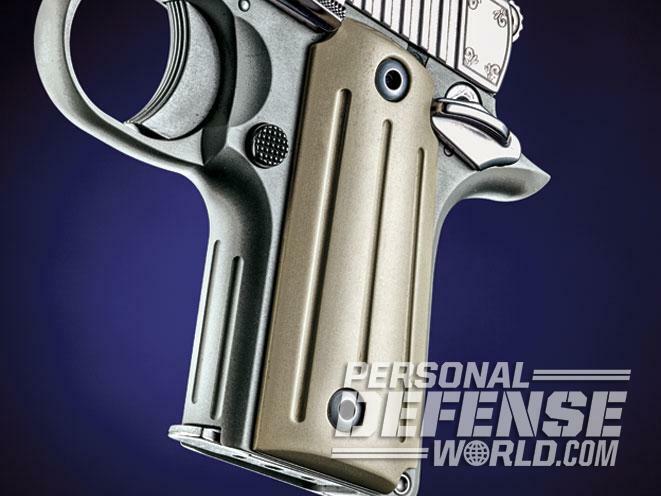 One quick look at the Diamond is all you need to know that it’s basically a micro-sized 1911. 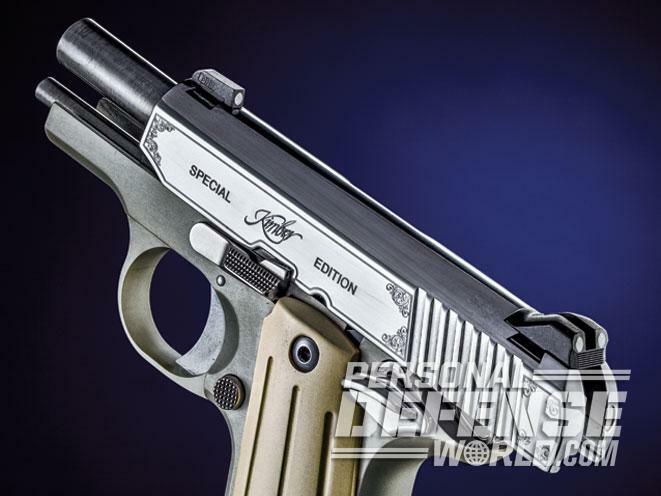 Considering the popularity of the 1911 platform, Kimber’s decision to base its subcompact pistols upon this popular design was a no-brainer. 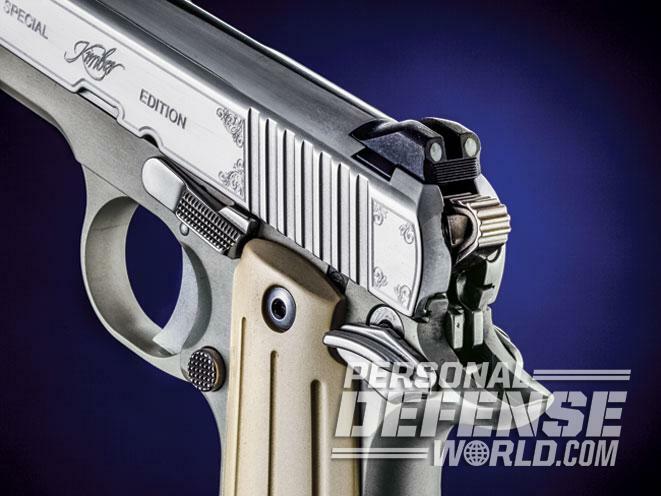 The Diamond’s stainless steel slide has the features you’d expect on a full-sized 1911. 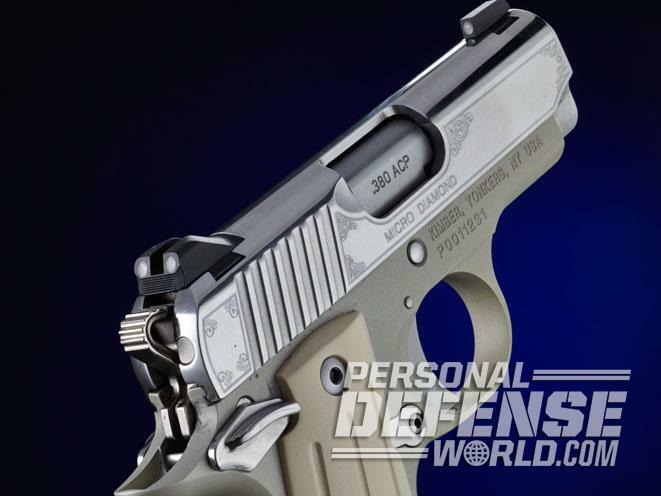 Sharply cut slide serrations allow you to charge the pistol reliably, even with wet or oily hands. A lowered and flared ejection port makes sure that spent cases are ejected fast and reliably, while the three-dot tritium night sights are mounted in dovetail cuts, which allows them to be adjusted for windage. The slide has a (really) bright mirror-polished finish and has been finely engraved with delicate scroll accents and “Special Edition” markings. While these features are not actually necessary on a pistol designed for concealed carry, as my wife Becky put it, “What’s wrong with a little bit of pretty?” Who am I to argue? 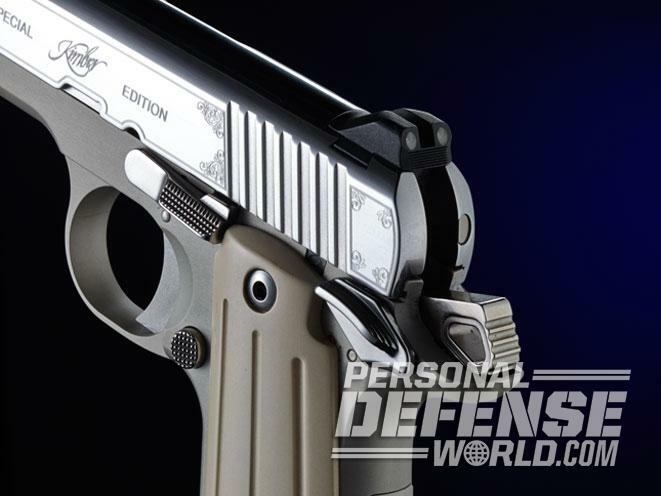 Like all of Kimber’s Micro pistols, the Diamond is a locked-breech design. 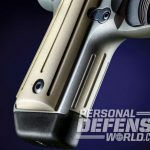 Upon firing, the barrel and slide recoil together for a short distance, whereupon the barrel articulates on the slide-stop lever shaft and is pulled down, disengaging the single barrel lug from a mortise in the slide. The slide continues to the rear, extracting and ejecting the spent case. A recoil spring under the barrel, positioned on a full-length guide rod, pulls the slide forward, picking up the next round from the magazine and chambering it as the slide goes into battery. Sounds just like the 1911. 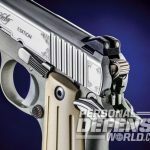 The aluminum alloy frame sports controls located in the “proper” 1911 positions, where they can be manipulated without moving the pistol around in your hand. The ambidextrous thumb safety will please the Southpaws among us, while a crisp single action (SA) trigger allows for accurate shot placement. The Diamond’s grooved Ivory Micarta grips set off the pistol’s bright finish, and they give you a little extra “pretty” in the deal. 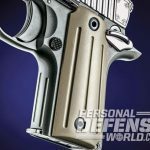 The Diamond’s frontstrap and mainspring housing have ball-milled grooves to provide a secure purchase, and a generously beveled magazine well permits fumble-free reloads, which I believe to be a welcome feature on pistols of this size. 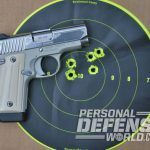 Two magazines were tested: a flush-fitting six-rounder and one with an extended baseplate that not only holds a seventh round of ammunition but provides a full three-finger grip without sacrificing concealability. 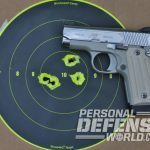 To see how the Diamond performed, I fired a series of five-shot groups from an MTM K-Zone rest at targets placed 10 yards away. While all three loads produced well-centered groups, I was really impressed with Winchester’s new Train & Defend load. Not only was it the most accurate, but felt recoil was definitely lower than the other two loads. 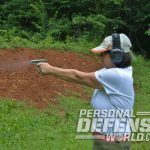 Becky had found the Diamond such an attractive pistol that we decided to let her run it through the rest of the test firing. 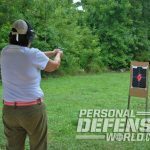 Before going out to the range, Becky familiarized herself with the Kimber’s operating drill, which is the same as her full-sized 1911 pistol. All the controls are in the same position and were positive in manipulation. It fit her hand well, the slide was easy to rack and the sights were excellent. 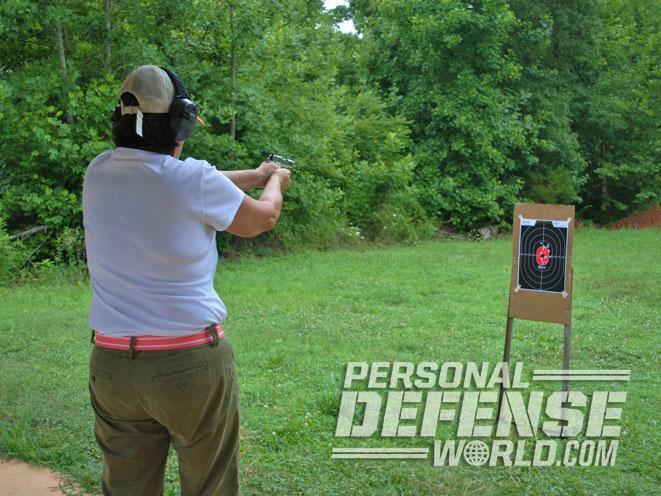 Being left-handed, she really liked the ambidextrous safety, and she was able to easily press the magazine release with her trigger finger for fast reloads. 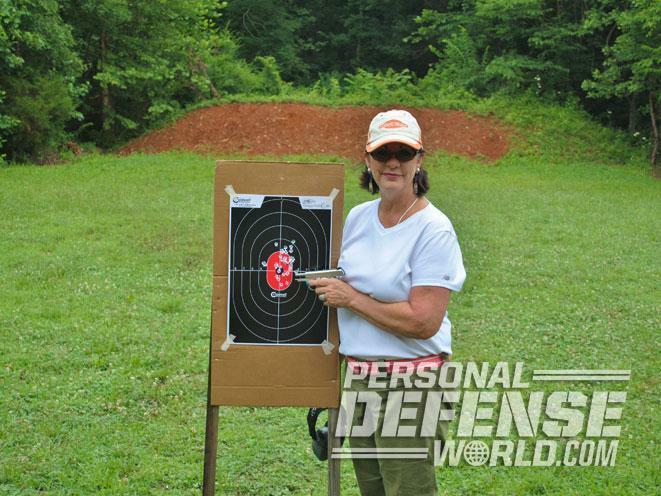 At the range, we set up a target at the real-world distance of 5 yards and she began shooting. 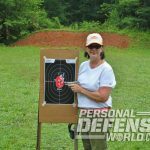 To her surprise, having never fired this pistol before, the 32 shots expended were closely grouped in the center mass of the target, and only one impacted outside of the 9 and 10 rings. 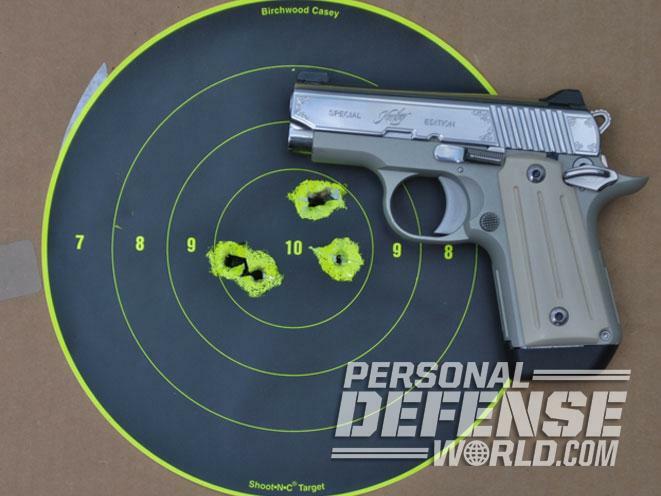 The recoil was minimal, which allowed for quick and accurate shooting. 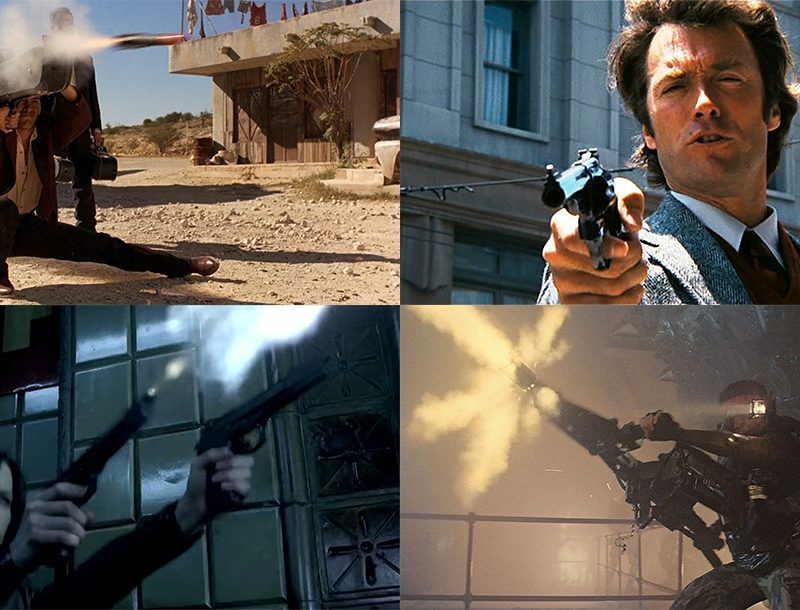 The SA trigger had a very short take-up and a crisp let off, which also allowed for accurate shooting. We felt this type of trigger could be helpful for a new shooter who has trouble with longer, heavier trigger pulls. 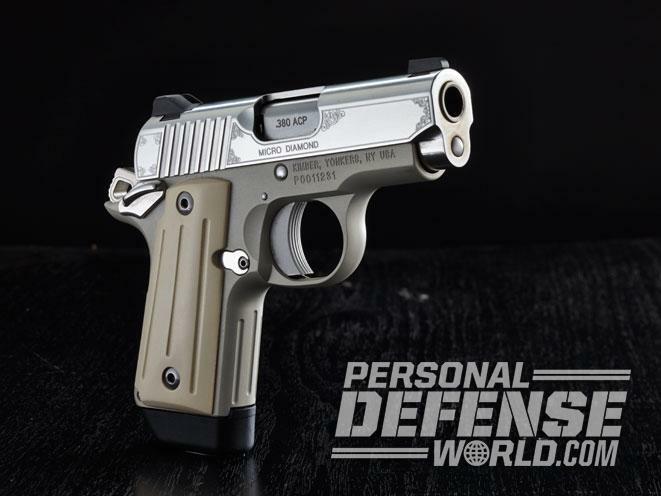 Overall, our impression of the Kimber Diamond was that it would be a practical choice for a concealed carry, especially for a person who prefers or needs a compact, easy-to-carry, light-recoiling handgun. 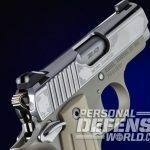 With its bright finish and Ivory Micarta grips, it lends itself to be an attractive, but practical, pistol for shooters.